The Apollo 16 command module shown before splashdown on Apr. 27,1972, after completing a lunar landing mission. 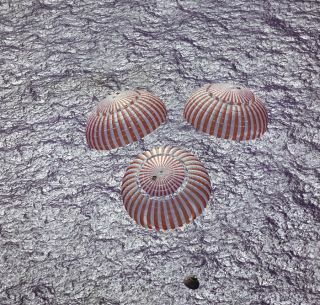 In this historical photo from the U.S. space agency, the Apollo 16 command module, with astronauts John W. Young, Thomas K. Mattingly II and Charles M. Duke Jr. aboard, nears splashdown in the central Pacific Ocean to successfully conclude a lunar landing mission. This overhead picture was taken from a recovery aircraft seconds before the spacecraft hit the water. The splashdown occurred at 290:37:06 ground elapsed time at 1:45:06 a.m. (CST), April 27, 1972, at coordinates of 00:43.2 degrees south latitude and 156:11.4 degrees west longitude, a point approximately 215 miles southeast of Christmas Island.